If I had to choose one favorite Christmas cookie, well, I couldn’t do it. But, if I could have a top ten, this gingerbread cookie would definitely be in it. 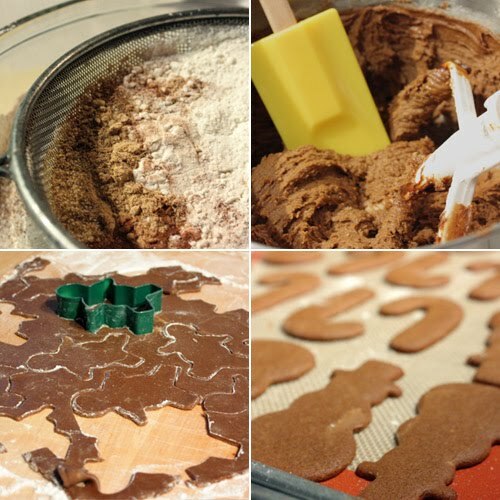 The cookies and bars and treats that I call Christmas cookies are certainly just as delicious for any other occasion, but when the weather is cooler and the holidays are fast approaching, gingerbread somehow becomes a little bit even more delicious. How does it do that? The flavor just seems right at this time of year. This recipe comes from the Martha Stewart Cookbook , and the ginger, cinnamon, cloves, and molasses combine in a wonderful way. In the book, the recipe is called gingerbread cupids, and there’s a similar recipe available on the Martha web site called gingerbread snowflakes. The recipe online includes ground pepper, but it’s not part of the recipe in the book and I’ve never added it. This dough is a little sticky even though I always chill it overnight before rolling, and I use a generous amount of flour on the board and rolling pin. On the bright side, once baked, the cookies retain their flavor and texture for several days if they last that long. I’ve also baked them in advance, frozen them, and then let them thaw before decorating. The cookies are fairly sturdy if stored carefully, but the sturdiness really depends on the shapes of the cookies. I made some reindeer, and I’m worried those slender legs could snap off easily. I made a big batch this time, and I enjoy making the dough, rolling it out, deciding which shapes to make the cookies, and smelling the gingerbread as the cookies bake. Then, my energy seems to dwindle when it comes time to decorate them. When I was little, my favorite thing about cookies was decorating them. These days, I may have lost my cookie decorating creativity, but that’s where my nieces enter the picture. I’m going to send them a box of these cookies to decorate and see what cute ideas they come up with for all the different shapes. What fun! Your cookies look terrific! Fantastic!! I love gingerbread cookies. I always make a small batch for myself during this time of year. Those are such pretty cookies! a wonderful Christmas treat! I agree- I love gingerbread cookies! Yours are adorable...I love the way you dusted them with sugar. I like how you decorated the cookies, simple and so pretty! There's just something about gingerbread people that makes me smile! Your reindeer is so cute too - hope the legs stay put. Beautiful cookies. I can almost smell them from here..
Lisa, je découvre ton blog et j'aime beaucoup. Wow, your topping decoration is amazing, it's my first time come across this, very very special. Love them totally. they look like real snow! You even say that is not creative??? I don't think I ever had a gingerbread cookie. Shame on me! They seem a little tricky to make, though. Many years ago I made sugar cookies, that had to be rolled out carefully, cut, etc. 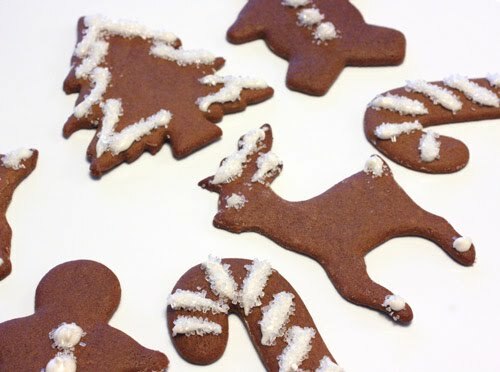 Are gingerbread cookies easier do roll out? Also, once they are baked, they become very hard or a little crumbly? Love the white sugar on the dark, they look fantastic and festive. I love the crunch of gingerbread the best. I wish my house could smell permanently of gingerbread. In fact, I wish they made an air freshener that had as an intoxicating fragrance as gingerbread cookies right out of the oven. Oh, gingerbread cookies, now I l know its the holidays. I have serious cookie envy now! They look cheerly good Lisa. I can't wait to make Gingerbread cookies! I love how you decorated yours. Simply and so pretty. I usually do my baking one day and the decorating the next. I run out of steam too. Beautiful cookies! I've used the gingerbread snowflake recipe for several years and love it. We like them with a little lemon or orange extract in the royal icing. Your blog is truly inspiring ... Love my first visit here! Merry Christmas to you ... Keep up with the good work yea? I love your simply decorated ginger cookies. I too would be unable to answer the what's your favorite xmas cookie question. And martha, she does have the best collection of cookie recipes. They are beautiful. I always make gingerbread cookies every year. They are a favorite in the house. Well I think you have done very well on the decorating part! Nothing beats simplicity! 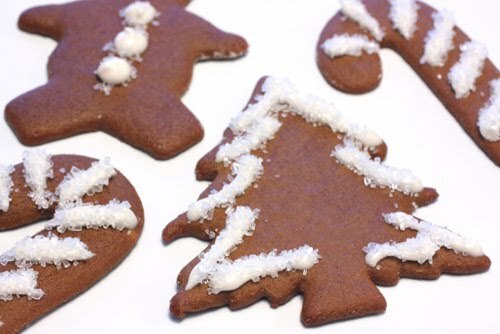 I love gingerbread too and it's the perfect time of year to make them! Pearse: I'm sorry, I don't remember where I found the reindeer cutter. I've had it for years. It may have come from a local shop, but I really don't remember. Sur la Table has a lot of cutters, and you may find something similar there.